Introduction: The oncological adequacy and safety of major liver resections is still uncertain. The aim of this retrospective analysis was to compare intraoperative data with final pathology and short-term clinical outcome. Methods:Patients undergoing laparoscopic liver surgery were retrospectively analysed using our tumor registry. Surgical and postsurgical outcomes were compared with final pathology. The data were statistically analyzed using ANOVA and Fisher’s Exact test. 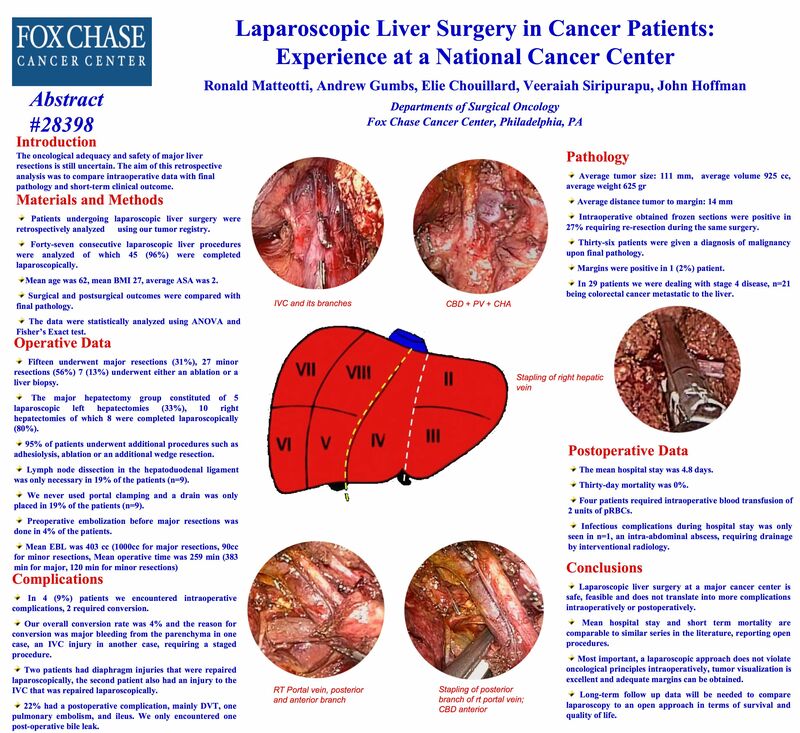 Results: Forty-nine consecutive liver procedures by a single surgeon were analyzed, of which 47 were attempted and 45 (96%) completed laparoscopically. Mean age was 62, mean BMI 27, average ASA was 2. Fifteen underwent major resections (31%), 27 minor resections (56%) 7 (13%) underwent either an ablation or liver biopsy. The major hepatectomy group constituted of 5 laparoscopic left hepatectomies (33%), 10 right hepatectomies of which 8 were completed laparoscopically (80%). 95% of patients underwent additional procedures such as adhesiolysis, ablation or an additional wedge resection. In 4 (9%) patients we encountered intraoperative complications, 2 required conversion. Our overall conversion rate was 4% and the reason for conversion was major bleeding from the parenchyma in one case, an IVC injury in another case, requiring a staged procedure. Two patients had diaphragm injuries that were repaired laparoscopically, the second patient also had an injury to the IVC that was repaired laparoscopcally. Twenty-two percent had a postoperative complication, mainly DVT, one pulmonary embolism, and ileus. We only encountered one post-operative bile leak. Lymph node dissection in the hepatoduodenal ligament was only necessary in 19% of the patients (n=9). We never used portal clamping and a drain was only placed in 19% of the patients (n=9). Preoperative embolization before major resections was done in 4% of the patients. Mean EBL was 403 cc, Mean operative time was 259 min. Intraoperative obtained frozen sections were positive in 27% requiring re-resection during the same surgery. Thirty-six patients were given a diagnosis of malignancy upon final pathology. Margins were positive in 1 (2%) patient. In 29 patients we were dealing with stage 4 disease, n=21 being colorectal cancer metastatic to the liver. The mean hospital stay was 4.8 days. Thirty-day mortality was 0%. Four patients required intraoperative blood transfusion of 2 units of pRBCs. Infectious complications during hospital stay was only seen in n=1, an intra-abdominal abscess, requiring drainage by interventional radiology. Conclusions: Laparoscopic liver surgery at a major cancer center is safe, feasible and does not translate into more complications intraoperatively or postoperatively. Mean hospital stay, short term mortality are comparable to similar series in the literature, reporting open procedures. Most important, a laparoscopic approach does not violate oncological principles intraoperatively, tumor visualization is excellent and adequate margins can be obtained. Long-term follow up data will be needed to compare laparoscopy to an open approach in terms of survival and quality of life.